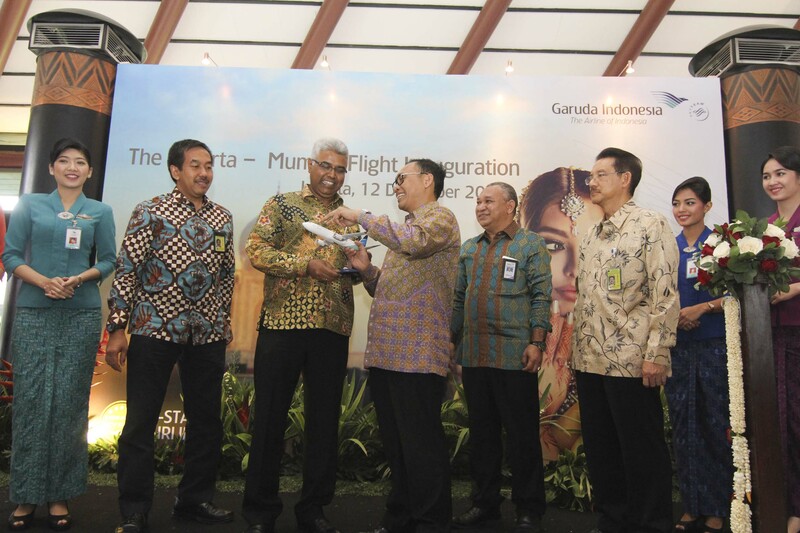 Jakarta, 2016-Dec-14 — /Travel PR News/ — Garuda Indonesia, the airline of Indonesia, further strengthens its global presence by launching a new service from Jakarta to Mumbai via Bangkok today. Mumbai serves as the airline’s first gateway in the region, and by launching the three times weekly service to Mumbai, Garuda Indonesia is now able to provide the first direct link between Indonesia and India. The opening of Garuda Indonesia’s flight to Mumbai is part of its international network development program, especially in the South Asia region, as well as the manifestation of the airline’s strong commitment to continuously support the Indonesian government’s program to double the number of international tourists visiting the country by 2019. Indonesia is currently one of the largest markets to India with 350,000 people currently traveling to the region on both business and leisure. This new direct route will not only boost the economic activities between the two countries, but also help towards meeting the Indonesian government’s target to increase inbound tourism to Indonesia from India. Mumbai is the most populous city in India and the ninth most populous agglomeration in the world, with an estimated city population of around 20 million. Positioned on the west coast of India, Mumbai is the financial, commercial, and entertainment capital of the country. It is also one of the world’s top ten centers of commerce in terms of global financial flow, generating 6.16 percent of India’s GDP and accounting for 25 percent of their industrial output, 70 percent of the maritime trade in India, and 70 percent of the capital’s transactions to India’s economy. It is also the wealthiest city in India, and has the highest GDP of any city in South, West, or Central Asia. Garuda Indonesia’s Mumbai-bound service will be operated by Garuda’s Boeing 738 aircraft with a two-class cabin configuration featuring its globally praised Business Class service concept and the World’s Best Economy Class (Skytrax Global Airline Awards 2013). The aircraft is capable of carrying 156 passengers (12 Business Class seats and 144 Economy Class seats). The Indonesian carrier was recently awarded a five-star rating by Skytrax, making it the seventh airline to earn this prestigious award. After winning the title “World’s Best Regional Airline” in 2012, Garuda Indonesia was named “World’s Best Economy Class” in 2013 and ‘World’s Best Airline Cabin Crew’ by Skytrax in 2014, 2015, and 2016 for the third year running. Garuda Indonesia officially became the 20th member of the SkyTeam alliance in March 2014, and the second Southeast Asia member. By becoming a member of the alliance, Garuda Indonesia is now able to provide its customers access to the alliance’s 1,052 destinations in 177 countries, covering over 90 percent of the most relevant traffic flows in the world, and also 516 lounges worldwide. Presenting a new level of service excellence in air travel, Garuda Indonesia, the national airline of Indonesia, seamlessly connects 77 destinations worldwide to not only one of the largest economies in Southeast Asia, but also an array of exotic locations in the beautiful archipelago of Indonesia all at once. With more than 600 daily flights, and a fleet of 197 aircrafts by end of 2016, with an average aircraft age which is less than five years old, Garuda Indonesia proudly serves its passengers with the award-winning “Garuda Indonesia Experience” service, which highlights Indonesia’s warm hospitality and rich diverse culture. This entry was posted in Airlines, Business, Flights, Travel, Travel Services, Travelers and tagged Garuda Indonesia, Jakarta to Mumbai via Bangkok, M. Arif Wibowo, new service. Bookmark the permalink.